So you need an XRF analyzer for fast, reliable alloy grade identification, but every time the boss or the buyer starts to ask you questions, you get tongue-tied? How does XRF for alloy grade identification work? What information does it provide? How accurate is it? You’ll find the answers here. Contact us to speak with a knowledgeable member of our team. A high-energy primary x-ray beam is emitted from the x-ray tube of an XRF analyzer. The high-energy x-ray beam interacts with the atoms in your alloy sample by knocking electrons out of the inner orbital shells of the atom, because the x-ray beam has a higher energy than the energy that binds the electrons to their orbits. The electrons of an atom are bound at specific energies in their orbits. Additionally, orbital shell spacing is unique to each atom, so an atom of Fe (iron) has a different spacing between its orbital shells than an atom of Cr (chromium) than an atom of Ti (titanium) etc. When the primary x-ray beam energy knocks electrons out of their orbit and leaves vacancies where electrons belong, the atom becomes unstable and needs to fill those vacancies right away. It can fill those vacancies by grabbing electrons from higher orbits and moving them to a lower orbit. 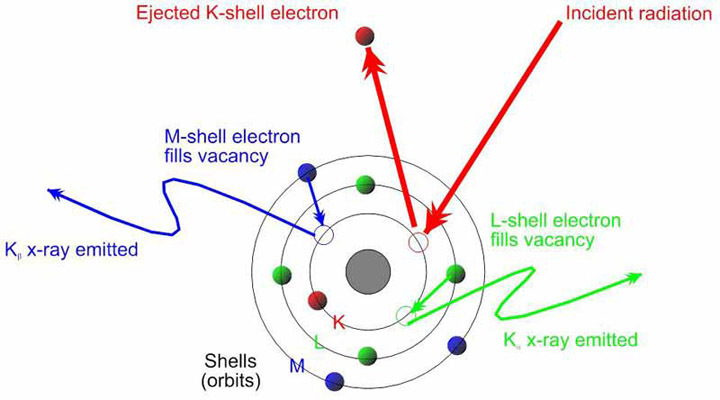 For example, if an electron is knocked out of the K-shell (the innermost shell closest to the nucleus), an electron from the L-shell (the next shell up from the K-shell) can move from L to K to fill the vacancy created by the primary x-ray beam in the K-shell. This is fluorescence. The further an orbital shell is from the nucleus of an atom, the more energy it takes to bind it there. In the above example, it takes more energy to bind an electron in an L-shell orbit than it does to bind an electron in a K-shell orbit, because the L shell is further from the nucleus. Because of this, an electron that moves from a higher orbital shell to a lower orbital shell (one closer to the nucleus) must lose some energy. In fact, the amount of energy lost is specific to the difference in energy between the two shells. This difference in energy is determined by the distance between the orbital shells, which-as mentioned in (2)-is unique to each element. The energy lost is therefore unique depending on the element from which it emanates. This energy is then detected by the detector in the XRF analyzer. Because the amount of energy lost in the fluorescence process is unique to each element (because each element has unique spacing between its orbital shells), the discreet fluorescent energies detected are indicative of which elements are present in the alloy sample. The proportions in which the discreet energies are detected are indicative of how much of each element is present in the sample, thereby providing complete quantitative alloy chemistry. The complete alloy chemistry is then referenced against the on-board alloy library, which contains the complete chemistry specs for hundreds of alloys. The instrument is therefore able to provide the user with reliable grade identification. And all of this takes place within a matter of seconds! 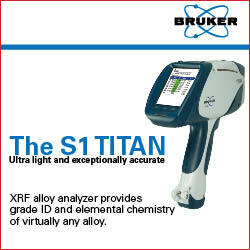 The BRUKER S1 TITAN, a state-of-the-art handheld XRF alloy tester, can identify most alloys in a matter of 2-5 seconds- Light Element alloys take just a few seconds longer. Because the alloy chemistry provided by the analyzer is a direct reflection to the proportion of elements present in the alloy, the XRF method of alloy identification is highly accurate, rivaling laboratory-quality results. Contact Bruker today for a free demonstration of the Bruker S1 TITAN at your worksite or a price quote.